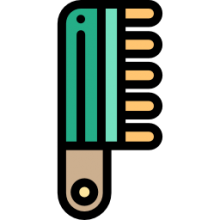 Hair laser combs are laser hair-regrowth devices that work for male and female pattern baldness, manufacturers claim, by stimulating hair follicles. 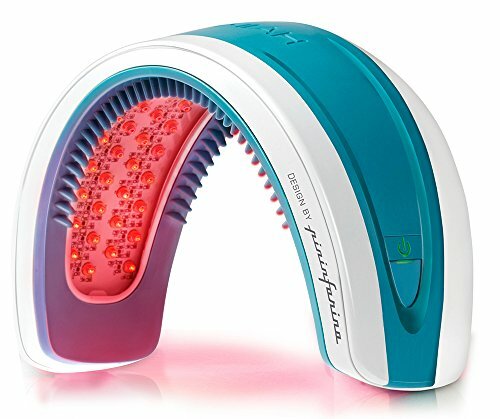 More specifically, the lasers in these hair laser combs work by activating light-sensitive Chromophores in your cells. 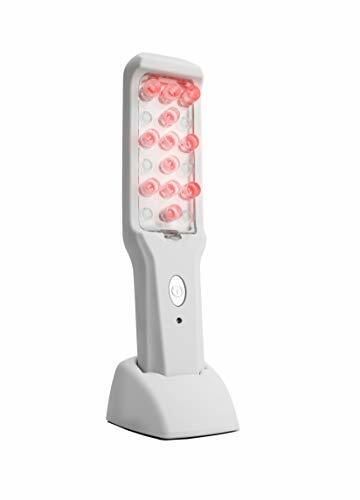 These Chromophores are activated by laser light and then trigger and signal a bunch of different cellular processes to stimulate hair growth (Source). As a hair-loss treatment, the hair laser combs are strong enough to reach deep into your scalp and follicles without actually causing your skin tissue to heat up, but still interact strongly with the Chromophores in your cells. You are probably skeptical, and I would be too, with all of the different hair growth fads on the market today. Though one research study that was published in April 2009 (admittedly conducted by HairMax themselves) described users employing the HairMax laser comb to achieve a hair regrowth rate of 17 hairs per square inch after 26 weeks of use. The researchers cautioned the results generally take around six months to become apparent and that laser combs to not work for everyone. Many people who don't experience positive results either haven't put in the time, are not using hair laser combs as part of an integrated hair regrowth strategy (including supplements and shampoos). Or they might just not be a candidate for hair regrowth, unfortunately. Our best advice is to check out the individual product pages and read the customer reviews of the individual products- you'll be able to get a sense of which products might work for you, and which are apparent frauds. That said, let's take a look at five of the best-selling, hair-regrowth laser combs on the market today and see how they compare. FDA-CLEARED & CLINICALLY PROVEN - At-Home Medical Device for treating hair loss and thinning hair for both women & men. The NutraStim Laser Comb is clinically proven effective by medical professionals on hair loss patients. It helps to stimulate the regeneration of hair cells by reversing miniaturization. Low-energy infrared, stimulate hair follicle, control oil and reduces dandruff, make hair smooth and healthy. Low-energy infrared, stimulate hair follicle and control oil. The professional grade, FDA approved laser hair growth brush from NutraStim is a high-quality option that uses twelve state-of-the-art low-level lasers to stimulate the scalp. Its users love that it is great at providing noticeable hair growth, but also note that it cannot be used if one has certain medical conditions. It weighs about 1.5lb, comes with a one year manufacturer’s warranty and is designed and produced in the USA. 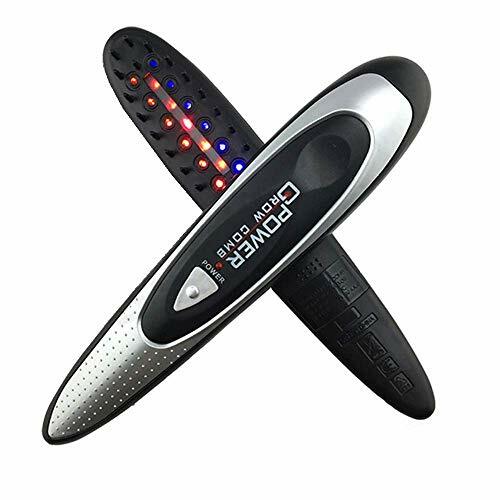 This laser comb is a great option if you are looking for an expensive yet effective hair growth comb. The customer reviews for the NutraStim Hair Laser Comb are overall quite positive. Most users reported seeing great results after a few months of use. However one customer claimed to have received an improper warning from the device in the form of a pink light rather than red, and upon continued use wound up losing a significant amount of hair in the treated area. This customer was pleased to receive a refund but warns consumers to read the instructions carefully before use. The lightweight, battery-powered HairMaxLaserComb is a popular option that uses 7 medical lasers to stimulate hair growth. Its users are pleased that it is very easy, but also note that it works very slowly if at all. FDA approved, its patented teeth pull hair aside allowing the lasers to penetrate the scalp directly, it’s lightweight and portable and comes with a storage stand, travel pouch, and four AA batteries. 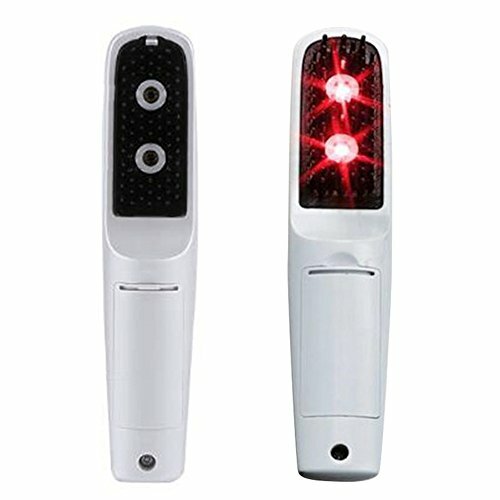 This laser hair growth device is a questionable option if you are looking for a safe laser hair comb. The user ratings for the HairMax – LaserComb Advanced7 – Treatment for Thinning Hair are rather low. Most users report that the product didn’t work at all and many warn other potential customers not to purchase it. One particular customer claimed to have started losing hair faster after using the product. Some customers point out that if the hair loss is due to genetics then this product will not work. Several users reported that their unit broke within a short amount of use. However, there are a handful of customers who stand by this product and state that it has helped them significantly. The rechargeable, lithium-ion-powered professional 12 laser therapy brush from HairMax is an expensive option that has an LCD screen which shows battery percentage and clocks treatment time. Its users are happy that it is good at thickening hair, but also note that it’s not very good at making hair grow back. As its name suggests it uses twelve individual lasers to nourish the scalp and is FDA cleared. It’s about 10in long, weighs around 2lb, and comes with a high-end portable travel case. 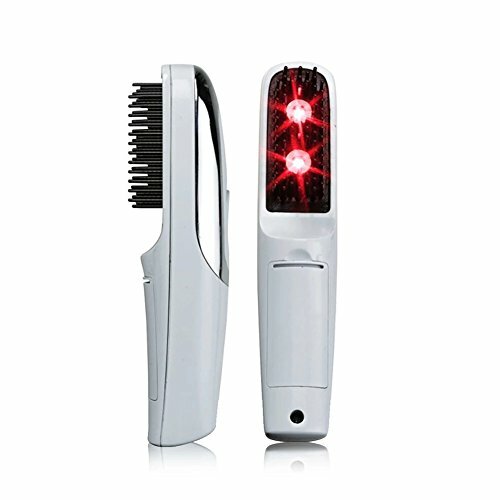 This laser comb is a reasonable option if you are looking for an easy-to-use yet slow working laser hair therapy comb. The general review for the HairMax Professional 12 LaserComb is mixed. Many customers report that it works very well for them after a long period of use, while others who have used it for a long period of time claim to have seen no results. There is however a consensus that it has very limited effect on causing bald spots to grow hair back and is more useful for thickening and strengthening thinning hair. One consumer reported experiencing increased hair loss for several weeks after using the product and was informed by the manufacturer that hair loss is normal within the first few weeks of use. This customer also noted that hair loss is a described side effect of the product. The cordless, 660nm RED Light hair growth brush by Project E Beauty is an affordable option that has two comprehensive light sources. Its users enjoy that it is very inexpensive, but also note that it takes a very long time to start working. It has built-in vibration to stimulate the scalp, works straight from the box with an easy one-button interface, covers a large area and requires two AAA alkaline batteries. This portable vibration hair stimulating brush is a decent option if you are looking for an easy-to-use hair growth comb. 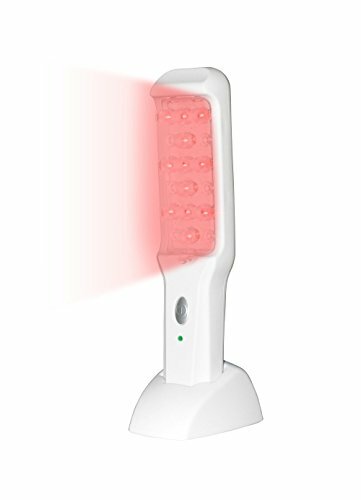 Customer reviews for the Project E Beauty Pro Portable 2in1 RED LED Light + Vibration Hair Growth Comb are mixed. Many users state that it functions as described although they report little or very slow results. A handful of customers reported that the product malfunctioned shortly after purchase or didn’t deliver any results at all, and a small minority said that various parts broke quite quickly. One consumer claimed that in combination with other hair growth treatments they were able to triple the thickness of their hair. Although another customer claimed that they were unable to use the product due to an underlying medical condition. as well as better quality hair. *all for users diagnosed with Andeogenetic Alopecia. If you are looking to grow your hair, it's likely that you have examined many different options- with hair-regrowing laser combs as one of your final examinations. Indeed, users report mixed results, with some people claiming that these red light hair growth combs have been effective in regrowing their hair through the use of monochromatic beams, while others didn't experience positive results at all. It's important to note, that many people who have left negative reviews of these hair laser combs oftentimes didn't take the care and consideration to truly invest in positive outcomes. It will take time for these hair laser brushes to get working, and the only part of a holistic process of hair regrowth-for instance the HairMax laser comb recommends using their hair regrowth brush in conjunction with different shampoos and supplements. One user that we were in contact with describes a pretty long and intensive process to see positive results. They describe using different hair loss shampoos, working with medical professionals who prescribed them prescription-strength hair loss drug treatments, and also supplements that were able to inhibit DHT in his scalp. He described DHT as a type of enzyme that makes your hair follicles shrink, which causes them to fall out over time. His own methodology included a 4 to 6 month plan of action during which time he used his laser comb for eight minutes at a time, four times a week to treat his type 1 male pattern baldness. If you are looking for a hair regrowth solution, or just a natural cure for female or male pattern baldness- these laser devices could be an interesting avenue to investigate. While they are certainly not a cure for baldness, except in rare cases, they can be part of an effective integrative solution for stopping hair loss.